"I spend money without thinking about it"
sound familliar? it’s what most people do, managing money is boring, confusing and time consuming, but ignoring it never ends well. ample is the mindful money manager, we manage your money so you don’t have to and simplify the rest down to what you need. what is a happy score? 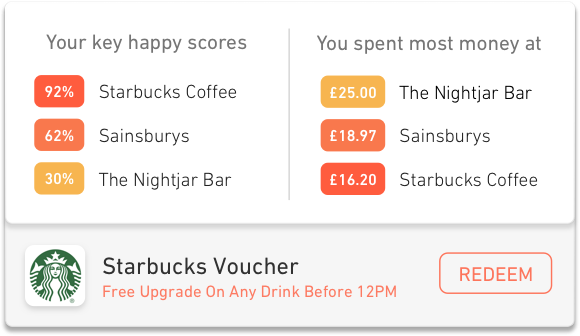 your happy score is how well you spend your money, it is based on your custom personality profile and transaction data from your bank. we give you a happy score for every purchase you make, so you can start to cut back on the things that don’t make you happy. We’ll even try to find vouchers for the things that do! we show you how your purchases live up to your values, care about rainforests? or human rights? You can help support business that match your values and join the mindful money movement.